Mr. Robot Season 2 to be 'Really F--king Dark' | Nerd Much? With NYCC in full swing this weekend, we knew we were bound to hear something about Mr. Robot. 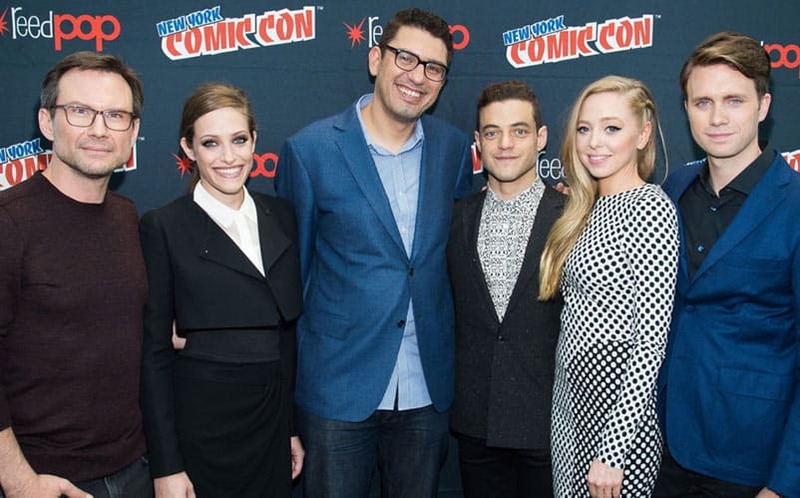 The entire core cast and creator Sam Esmail took the stage in New York yesterday to tease a little information about Mr. Robot Season 2. Esmail didn’t give us much info about the Season 2, but he did note that the tone for the series would be “Dark. It gets really f–king dark.” Esmail also said that the Mr. Robot persona would be returning next season, although that wasn’t ever really in doubt, being that the name of the show is Mr. Robot. The second season will have 10 episodes like the first, and will explore some of the history between Darlene, Elliot, and their father. It will also delve into how fsociety was formed. “For me in doing this show what’s cool is I don’t want you to just want to know what happens next. I want you to want to know what happened before,” teased Esmail during the panel. We loved the first 10 episodes of the show. We noted in our Mr. Robot Season 1 review that it felt like Dexter, but with the lead character hacking and injecting even more social anxiety. The show is the first good show to come out of USA Network’s original programming, and here’s to hoping that Season 2 continues on with everything we loved about the first season. For more on Mr. Robot, stay tuned to Nerd Much.